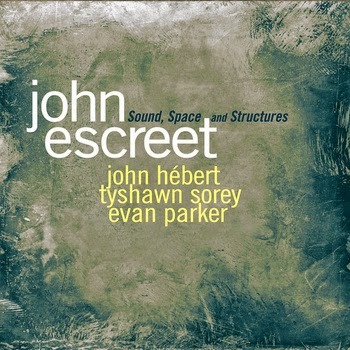 Though this isn't Evan Parker's album - which is obvious from the title - his work on it adds a thoroughly new dimension to the already excellent trio of pianist John Escreet, drummer Tyshawn Sorey and bassist John Hebert. The opening bars of Part I, finds Escreet delivering a rousing and percussive introduction that is wonderfully bolstered by the rhythm section, kicking things off as an excellent trio recording. However, when the Parker arrives partway through ‘Part II', the musical landscape changes. Minimalist and abstract, the tight tonal clusters begin to stretch out, leaving just points and constellations for Parker’s to navigate with his piercing sax . Escreet and Parker play off of each other, finding complimentary sounds and textures both inside and outside the traditional ranges of their respective instruments. John Hebert’s bass and Tyshawn Sorey’s percussion provide a nuanced level of support and interplay that spotlights Parker’s inventiveness. Part VI and Part VII are nicely contrasting pieces, the former being introspective and melancholic, and the latter a ferocious romp with strident rhythms and ebullient sax work. Over the course of the eight and a half minutes, each musician comes to the front, the track is in a constant state of re-construction. Parker, a master of space as much as all the other techniques, drops on and out when, I assume, he feels the moment is most appropriate. Highlighting Parker's contribution is to call out but one aspect of this excellent recording, the musicians are intertwined, interdependent and all highly individual, creating an indelible impression with their improvised prowess. Teeming with spontaneity and life, Sound, Space and Structures is worth a listen by anyone interested in a improvisation masterclass.